This charming country inn and spa specialize in a totally relaxing vacation experience. 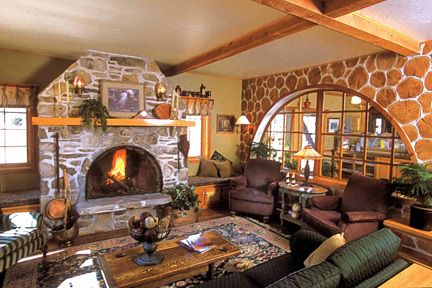 Beautiful inn rooms and whirlpool suites all have fireplaces and kitchenettes or dry bar. Heated outdoor pool, hiking trails, continental-plus breakfast, beer pub, horseshoes, sand box, grills and shops. The Lavender Spa is an intimate massage therapy spa offering Swedish massage, massage facials, hot stone, aromatherapy, couples romantic spa packages, girls getaway packages and more. Join us! 2019 Rates: $109-$399 OS; $169-$399 PS. Nov-Apr Coach House Suite available.